The space group of hexagonal H2O ice is P63/mmc. 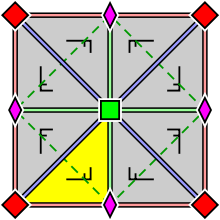 The first m indicates the mirror plane perpendicular to the c-axis (a), the second m indicates the mirror planes parallel to the c-axis (b) and the c indicates the glide planes (b) and (c). 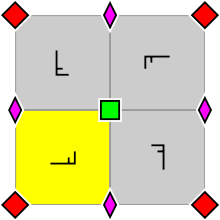 The black boxes outline the unit cell. Space groups in 2 dimensions are the 17 wallpaper groups which have been known for several centuries, though the proof that the list was complete was only given in 1891, after the much harder case of space groups had been done. In 1879 Leonhard Sohncke listed the 65 space groups (sometimes called Sohncke space groups or chiral space groups) whose elements preserve the orientation. More accurately, he listed 66 groups, but Fedorov and Schönflies both noticed that two of them were really the same. 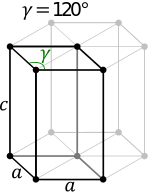 The space groups in 3 dimensions were first enumerated by Fedorov (1891) (whose list had 2 omissions (I43d and Fdd2) and one duplication (Fmm2)), and shortly afterwards were independently enumerated by Schönflies (1891) (whose list had 4 omissions (I43d, Pc, Cc, ?) and one duplication (P421m)). The correct list of 230 space groups was found by 1892 during correspondence between Fedorov and Schönflies. Barlow (1894) later enumerated the groups with a different method, but omitted four groups (Fdd2, I42d, P421d, and P421c) even though he already had the correct list of 230 groups from Fedorov and Schönflies; the common claim that Barlow was unaware of their work is a myth. Burckhardt (1967) describes the history of the discovery of the space groups in detail. The elements of the space group fixing a point of space are rotations, reflections, the identity element, and improper rotations. In n dimensions, an affine space group, or Bieberbach group, is a discrete subgroup of isometries of n-dimensional Euclidean space with a compact fundamental domain. 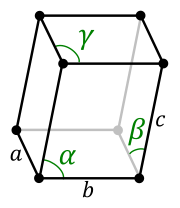 Bieberbach (1911, 1912) proved that the subgroup of translations of any such group contains n linearly independent translations, and is a free abelian subgroup of finite index, and is also the unique maximal normal abelian subgroup. He also showed that in any dimension n there are only a finite number of possibilities for the isomorphism class of the underlying group of a space group, and moreover the action of the group on Euclidean space is unique up to conjugation by affine transformations. This answers part of Hilbert's eighteenth problem. Zassenhaus (1948) showed that conversely any group that is the extension of Zn by a finite group acting faithfully is an affine space group. Combining these results shows that classifying space groups in n dimensions up to conjugation by affine transformations is essentially the same as classifying isomorphism classes for groups that are extensions of Zn by a finite group acting faithfully. This table give the number of space group types in small dimensions, including the numbers of various classes of space group. The numbers of enantiomorphic pairs are given in parentheses. ↑ Hiller, Howard (1986). "Crystallography and cohomology of groups". Amer. Math. Monthly. 93: 765–779. doi:10.2307/2322930. ↑ "The CARAT Homepage". Retrieved 11 May 2015.